QRP TO QRO. Our Wattmeters can measure from 200 milliwatts to 5 kilowatts, from 160 meters to 6 meters with no slugs! They display both SWR and POWER at the same time! Note: This text is common to the entire line of Alpha 4500A Series Wattmeters. 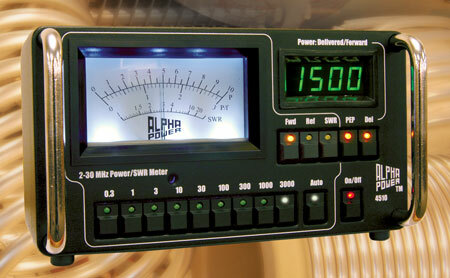 The Alpha 4500A Series High Frequency RF Power Meter is a laboratory grade device capable of measuring and displaying Transmit Forward power, Reflected power, Delivered power, and SWR at continuously variable power levels.The 4510A and 4520A models are 3 kilowatt and 5 kilowatt models with a USB interface and come with a fully functioning front panel including a digital display and a multi purpose analog meter movement. The 4510A meter can range from 0 to 3 kilowatts using nine ranges from 200 milliwatts (-7dBW) to 3 kilowatts (+34.8dBW) full scale, while the 4520a meter can range from 0 to 5 kilowatts using the same nine ranges from 10 watts to 5 kilowatts full scale. Experience the ease of use with our 4500A series wattmeters. Effortlessly measure Power and SWR over a broad frequency range with no need to purchase, install, or twiddle slugs to get a reading. And, our wattmeters are very accurate over a broad range of power levels, frequency bands, and temperature. The wattmeter is highly automated and includes circuitry to protect the unit against typical operating anomalies. The wattmeter automatically determines the direction of power flow, allowing the rear panel coax connectors to be connected interchangeably between RF source (transmitter) and load (antenna). The coax connectors normally supplied are UHF style (e.g., they mate with PL-259 plugs) but they are field replaceable if a different style of connector is preferred (BNC or type N) or if the connectors become damaged. The wattmeter is capable of simultaneously displaying the Transmitter output power level in the seven segment LED display, plus either Reflected power, SWR, or Forward power in the analog meter display. Transmitter output power can be displayed as either Forward power or Delivered power (Forward Power minus Reflected Power). The two models of wattmeter report all measurements as streaming data through the USB port located on the back of the unit, thus enabling real time data logging of station performance. The wattmeter is designed to work across the frequency segment 1.8 MHz to 54 MHz. The RF output levels reported by the wattmeter are temperature and frequency compensated to improve accuracy. Transmitter output power (either as Forward power or as Delivered power) is continuously displayed using the seven segment LED readout, and Forward, Reflected, and SWR are individually selected and displayed using the analog meter. The wattmeter is designed to switch automatically between nine different power ranges, permitting optimum analog meter deflection and display accuracy. Alternatively, at the touch of a switch, any one of nine specific power ranges can be individually selected from the front panel and the analog meter display “locked” into that power range. Returning the meter to the automatic mode simply requires pressing one switch. As a built in safeguard, if the applied power exceeds the full-scale reading when the unit is set to one selected power output level, no damage will occur to the analog meter. The wattmeter is supplied with a universal-input (100-240 V AC, 50-60 Hz) power supply that provides the unit a 12-Volt DC source. It is internally protected against reverse polarity and DC input transients that do not exceed 16 Volts. Upon removal of the DC power source, the analog meter movement is automatically shorted. The unit also features increased meter damping that allows rapid meter response during normal operation. These features also reduce the likelihood of meter damage during transit.